50 cm of textual records. 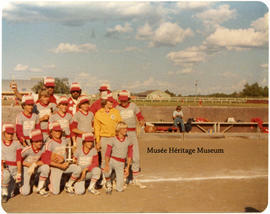 The St. Albert Minor Baseball Association (SAMBA) started in 1973 and was incorporated in 1977. The Legion Memorial Park started in 1979 which assisted the City with hosting the Alberta Summer Games during 1979. In 1977 the Ladies Auxiliary started. Expansion and facilities improvement were included in the Red Willow Urban Park Master Plan in 1992. The group has enjoyed the support of the St. Albert Legion. Renovation of facilities, including the clubhouse, was started with a $200,000 grant Community Facility Enhancement Program for Legion Memorial Park expansion and upgrading. The new clubhouse was opened in 1993. The fonds consists of correspondence, minutes of meetings, bingo and casino records, financial records, booklets, handbooks, regulations, manuals, Ladies Auxiliary records, bylaws, registrations, newsletters, membership lists, reports on coaches, and directory lists. Fonds appraised, rearranged and renumbered from collections database by assistant archivist, September 2016. Restricted access to some files that contain personal information. Related collection items numbered 1999.28.01-06 are catalogued in the collections database. Includes accessions 1995.50, 1997.02, 1999.28.